On April 26th, 2011, Alameda Citizens Task Force held the 2nd public “Workshop on Developing A Sustainable City Budget Plan” with Alameda City Treasurer, Kevin Kennedy and Alameda City Auditor, Kevin Kearney. The workshop was held at the Alameda Free Library at Lincoln and Oak Street in Alameda, CA. The workshop was designed to develop a report for the Alameda City Council about areas of public concern and suggested changes in various areas of the city budget. 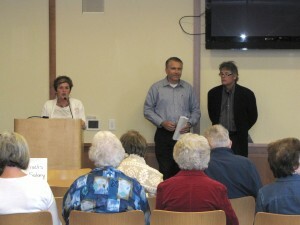 MC Nancy Rogers introduces Alameda City Treasurer Kevin Kennedy and City Auditor Kevin Kearney. After opening remarks by the City Treasurer and Auditor, the attendees divided up into 6 focus groups to discuss one of the following subjects: pensions, public employee contracts, salaries & overtime, cutting expenses, medical insurance benefits, and revenue enhancements. Each group’s facilitator provided information on the subject, kept notes and later provided the entire group with a summary of their group’s discussion. In the interest of transparency it was ACT’s goal to further educate the participants on the complexities of the city budget. A third meeting was scheduled to complete the process. 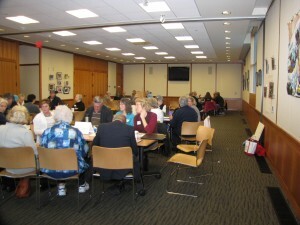 Workshop groups discuss budget items and develop recommendations supported by the public.